Language Central for Math helps ELLs and struggling students, grades 3 - 8, develop the academic vocabulary necessary to master math. Oftentimes it’s the math vocabulary, not the mathematical concepts, that hinder student mastery. Language Central for Math is designed to directly address this issue – and to reinforce the instruction given in the math classroom. The curriculum that serves as the foundation of the program was developed by Fitchburg Public School District (MA), with a goal to provide better Mathematics access to its growing ELL population. 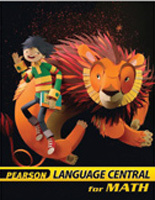 Language Central for Math incorporates this curriculum within an ELL instructional framework developed by Dr. Jim Cummins, Pearson Advisor and Professor at Univ of Toronto. It supplements any core math program. 15-20 minutes/day (before each math class).